First off, I want to thank the awesome people over at Del Rey and NetGalley for the ARC, even though I ended up finishing this one off via Audible because, umm, Tim Gerard Reynolds is the MAN. It is nice being able to get back into a series without any sort of expectations. Unlike a lot of people who loved the first three (3) books in the Red Rising series, I didn’t get to them until December 2017. I binged each novel via audiobook in anticipation for Iron Gold’s release because of the hype that surrounded it. Let me go ahead and tell you: the hype is legitimate. 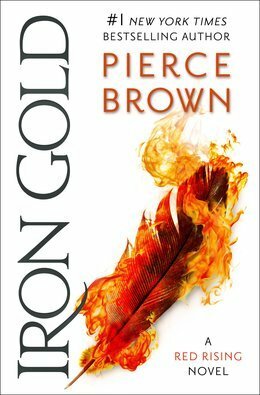 Iron Gold is in the early running for my top read of 2018. A decade after the events of Morningstar, Mustang is now Sovereign and her husband, Darrow, continues to fight for peace amongst the stars. As made famous by the game franchise “Fallout”, War Never Changes. While the Republic stands to keep order in the galaxy, the Senate is quickly rising in power and leading all in a direction that Darrow is unwilling to take. Darrow takes matters into his own hands and leads the Howlers on a mission with unforeseen consequences. Meanwhile, a Red girl escapes her refugee camp in hopes of a fresh start but becomes entangled in a feud that will change her life forever. An ex-Son of Ares, along with his motley crew of Colors, is contracted by a mysterious Duke to steal the most invaluable thing in the galaxy, but what he comes back to he never suspected. Lysander au Lune, grandson of the late Octavia and heir to the Sovereign, travels with Cassius au Bellona, his mentor and guide. The two become embroiled with those of the outer rim and ponder what their futures hold at the hands of their captors. As you can already tell, Iron Gold is a bit different from the original trilogy. It is told from four (4) different POVs that seemingly intertwine with one another as the story progresses. Also, with it taking place a decade into the future, it feels more like an adult story than a (which, IMO, you can’t call the original trilogy this) YA one. The action is grittier, the conversation more brutal, and the lives of those entangled within beyond redemption. Having said that, Brown injects everything you came to love in the first three (3) books, and then some. New characters, more plot twists, and an overarching sense of dread throughout the galaxy. I would recommend the audiobook because, well, Tim Gerard Reynolds. He narrated the originally trilogy superbly and does so again here. But, he is not alone. Julian Elfer, Aedin Moloney, and John Curless also lend their voices to this performance and, TBH, I thoroughly enjoyed it. Though pacing from a couple of the narrators could’ve been sharper, having a fresh voice for each unique POV works wonders for audiobooks and helps the narratives become clearer. All in all, go pick up a copy of Iron Gold and read it as soon as you can (if you read the original trilogy). I can’t, in all honesty, recommend it to those who have not experienced the awesomeness that is Red Rising. There are quite a few spoilers that, I believe, would taint the reading experience.